My first Jim Jarmusch film was Broken Flowers, which I saw as more of a Bill Murray film than a Jarmusch film. It was the Tom Hiddleston-Tilda Swinton starer haunting, one-of-its-kind vampire drama Only Lovers Left Alive (which also had Mia Wasikowska and late Anton Yelchin in the stellar cast) that made me take an interest in the veteran director and his body of works, sprawling over four decades (including the ongoing one). Jarmusch has this distinctive, very art-house style of filmmaking. In most of his films, nothing in particular happens, the narrative doesn’t function like a normal story, time doesn’t really move. In a comical, rather minimalistic style Jarmusch actually indulges celebrating the ordinariness of human life (His latest film, Paterson is about the everyday life of a bus driver who is also a poet, which I haven’t managed to watch yet). He makes the kind of cinema which might not be appreciated by a large section of mass, but you fall in love with them once you develop a thing for the mundane. People talk about nothing that is generally important. Sometimes, they just don’t talk and sit in silence. These films are like jokes without punchlines and that’s the beauty of them. I have been watching and exploring the films of Jim Jarmusch for the past one month and have been meaning to write something. In this process, I have also become a great admirer of Jim Jarmusch (a particular film has done that, coming to that later) and a ranking all his films article is in the pipeline. On his sixty-third birthday, I am going to write about three of his films which I personally found the most significant works of the man and can work as a sort beginners guide for all who want to explore the director. In this tale of one night at a dingy, mysterious Memphis hotel; Jarmusch takes a Japanese couple exploring America, an Italian woman with a dead husband, an American woman who talks a lot and just had a tiff with her boyfriend, three interesting men involved in dangerous things and mixes them all together, by telling three stories which are quite different from each other, but still very much interconnected. Jim Jarmusch uses a very interesting kind of narrative where he tells the stories separately, one after another where the audience gets to see (or hear) the same things from the different perspective of the characters. While the characters of these separate stories don’t meet with each other (except the last scene), the audience manages to establish a connection between all of them. The hotel receptionist and a clerk feature in all the stories and work perfectly as the bridge between everything. Interesting dialogues, a great screenplay and fine work from an ensemble cast which features the likes of Joe Strummer and Steve Buscemi help this making an intriguing, thoughtful watch. Beautifully shot and set in a lovely, quite Memphis haunted by the ghost of Elvis Presley; Mystery Train is a masterful piece of work which simultaneously work as an anthology as well as a singular film. THIS IS THE MOVIE THAT HAS MADE ME A JIM JARMUSCH FAN. Four years after his promising debut (Permanent Vacation), Jim Jarmusch came up with his sophomore effort, Stranger Than Paradise, which can only be described with one single term: Masterpiece. A subtle, darkly comical masterpiece should be a more accurate description of this film. Told in three different chapters, Stranger Than Paradise tells the story of cousins Willie and Eva (John Lurie and Eszter Balint), and Willie’s friend Eddie (Richard Edson). The film chronicles the journey of these three characters over the span of a year, while the narrative moves through different American landscapes, from New York to Cleveland to Florida. While no significant, life-changing things happen in the film, we see the characters are forming a strange bonding/friendship between them, and also drifting from places to places in search of something that matters in life, to some extent. A sense of melancholy chases them all throughout the film and never really let them go. The totally anticlimactic ending and monochromatic color palate compliment the whole thing further. Stranger Than Paradise, in my humble opinion, stands as a bleak, oddly funny masterpiece and Jarmusch’s greatest work till date. This is a film where people drink coffee and smoke cigarettes while talking about drinking coffee and smoking cigarettes and some other things. Yes, you read that right (if you are still reading this). No metaphor, no hidden meanings or anything else. This film is all about its title. Jarmusch assembles eleven short stories (some of which he made earlier) and put them all together in this anthology, where the stories are not at all connected with each other like Mystery Train. In all of the stories, people meet and talk about certain things while having coffee and cigarettes. 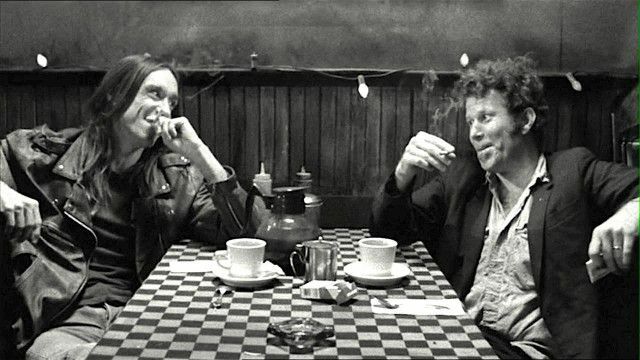 Jim Jarmusch draws clever reference of his earlier works as well, like in the segment “Twins” he takes two actors from Mystery Train (Steve Buscemi and Clinque Lee, the latter also appears in another segment, “Jack shows Meg his Tesla coil”, possibly the most interesting one) where one of them tells a story about Elvis’s twin brother. He also focuses on the aspect of the relationship between two people, be it two friends or strangers or cousins. The film also works as a kind of statuary warning where several characters condemn the idea of having coffee and cigarette as a meal and suggest something healthy; but as the warnings written in Cigarette packets are never read by anyone anyway, the characters in the film continue to blabber (or sit quietly) while wallowing themselves in caffeine and tobacco. Coffee and Cigarette is an extremely clever, interesting, true-blue Jarmusch movie which you should try if you have a thing for films which are all about people having conversations.